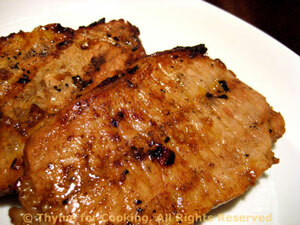 Savory Pork Chops, Marinated and Grilled, Thyme for Cooking main course. This is a simple marinade that works well with chicken and beef, too. The chops marinate in the time it takes to get the grill ready. Cook on barbecue for 5 - 8 minutes a side or until done. Should be slightly pink near bone when done - take a peak (techniques).